I apologise for my absence from the blog over the last couple of months – I do actually have a genuine (and pretty solid) excuse in that I was struck down with pneumonia at the beginning of December which resulted in a lengthy hospital stay and many weeks of recuperation. In fact, I’m still recuperating and as such have hardly been able to cook or bake much beyond heating things in the oven or on the hob. Kneading dough is strictly prohibited – especially after an attempt to help making biscotti at Christmas left me shattered and unable to move, even to scrape the dough off my fingers. So I wanted a recipe that required very little effort but delivered on flavour – and also was warming and comforting at the same time and I stumbled across an enticing looking one on the BBC Good Food site. 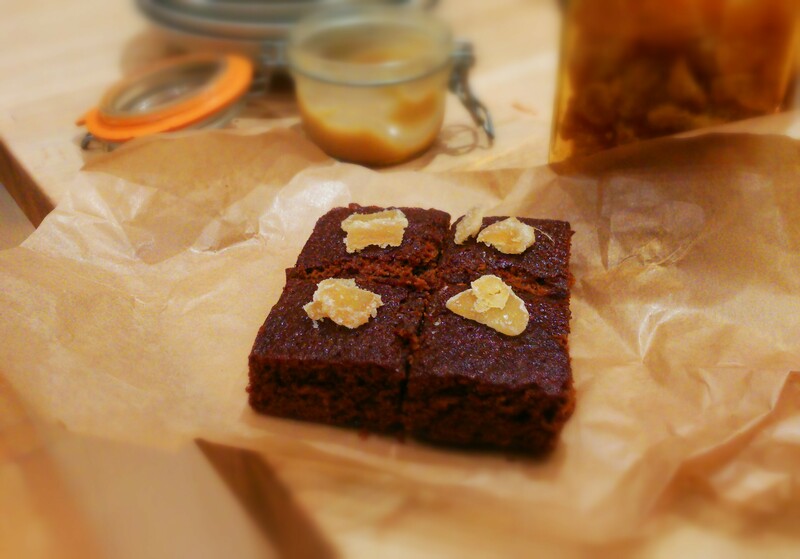 After a bit of tinkering I had the recipe I was looking for – this ginger cake is surprisingly light in texture but is wonderfully sticky (and gets stickier the next day) and is just the ticket for dark winter nights. 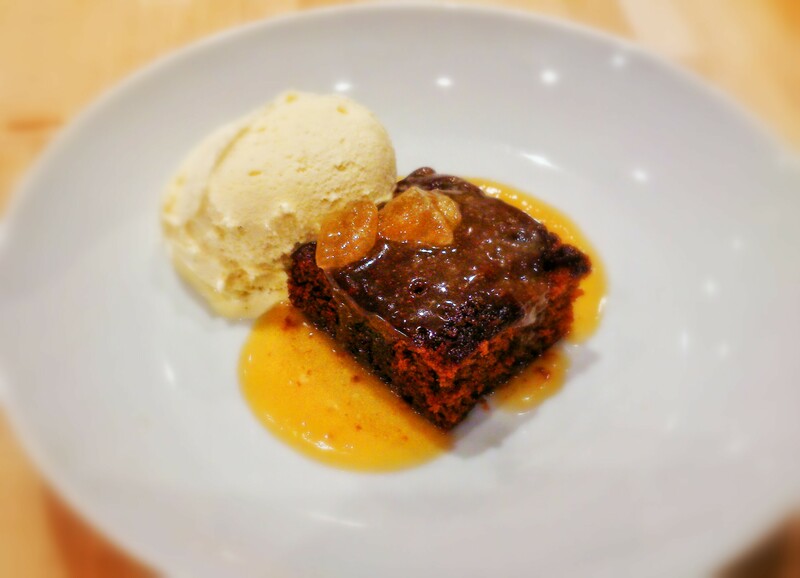 You can have it on its own or as a dessert served with caramel sauce and ice cream and it also freezes really well. Adjust the amount of spice to suit – I like mine nice and fiery! One thing to be aware of – the cake looks very wobbly as it approaches the end of the cooking time, don’t be tempted to leave it too long! Insert a skewer in to the centre and if it comes out clean then the cake is done – it will continue cooking in the tin. Grease and line a 20cm cake tin (or a 2lb loaf tin if you prefer) and preheat your oven to Gas Mark 3/170c. In a small saucepan, slowly melt the butter and golden syrup together then set aside to cool slightly. Sift the flours, spices, and soda into a mixing bowl then add the sugar and salt and stir to combine – if you are using molasses sugar it is worth spending a bit of time breaking up the big sticky lumps that will form (lumpy batter awaits otherwise!). Mix in the milk and beaten egg and stir until you have a smooth batter then slowly add in the melted butter/syrup mixture. Pour into the prepared tin and bake for 50-55 mins until firm to the touch (and clean to the skewer test) then remove and allow to cool in the tin for five minutes or so before turning out onto a cooling rack. Once cool, cut into squares, adorn with crystallised ginger (if using) and enjoy with any variety of sweet accessories – whisky cream, salted caramel sauce, ice cream, toffee sauce, chantilly, the list goes on…..
As the weather slowly changes from Autumn towards Winter and the prospect of dark, cold evenings becomes a reality, sometimes a traditional pudding is the best thing to cheer you up. I love sticky tarts (ahem), apple pies, steamed puddings and all the gloriousness that goes with them but time isn’t always on my side when I’m in the mood to make them – many hours can be dedicated to a rich suet pudding and quite frankly I can’t always be bothered. The great thing about Apple Charlotte is that the puree can be made in advance and stored in the fridge until needed which certainly cuts down on overall cooking time and general kitchen tomfoolery. This recipe is adapted from various traditional versions and, like all good culinary creations, ultimately came down to what was available at the time rather than an exact list of ingredients that were all bought in specially. I made it with my good friend and camping companion on a visit to his home in Bristol – we decided the weather wasn’t good enough for tent-based times so instead spent a fair amount of time stuffing our faces and drinking ale and prosecco. 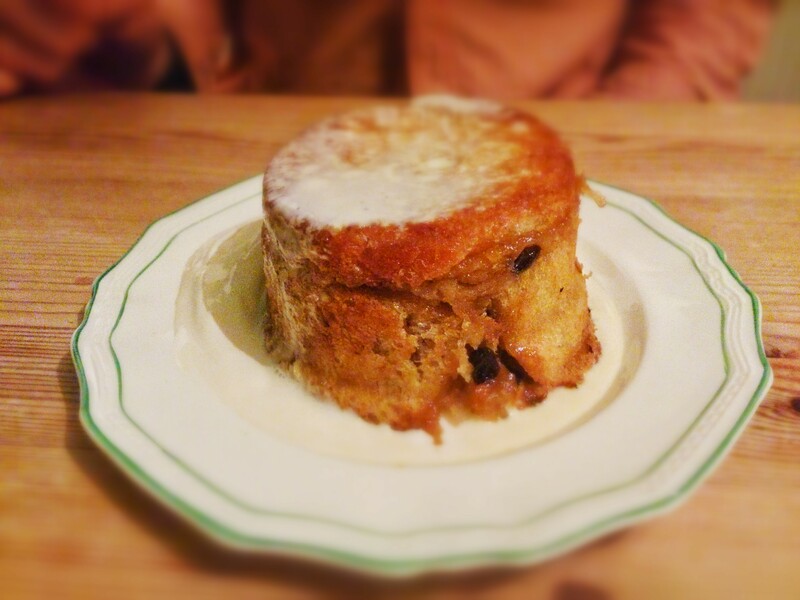 These puddings are often made with a mixture of cooking and eating apples but we found that a splash of cider helped to add a pleasing edge to the flavour and also added a bit of extra liquid. Eating apples don’t break down in the same way as a good Bramley so you will need to give it a good bashing as it cooks to achieve a smooth puree. Or keep it chunky. Your choice. First, make the puree. 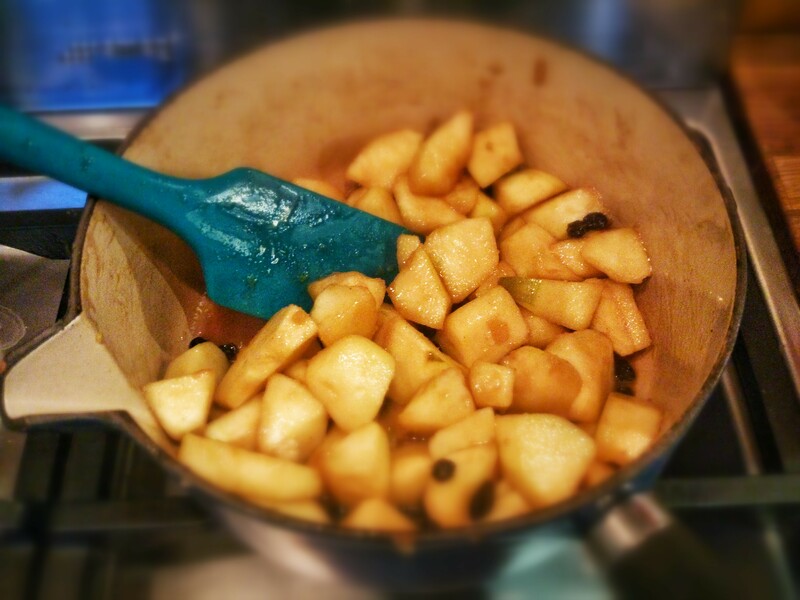 Melt half of the butter along with the sugar in a good-sized pan then add the chopped apples, raisins, and cinnamon. Mix everything together until coated in the glorious sticky goo then add the brandy and cider and stir, adding a bit more liquid if it looks in danger of drying out. Sugar, cinnamon, butter, brandy, apples. Everything about this is good. Simmer gently until the apples have broken down to a pulp and your kitchen smells like a stand at a German Christmas market – spicy, sweet, and boozy – then set the puree aside to cool completely. Depending on how deep your ramekins are, cut the slices of bread to line it completely – we used shallow ones so cut a disc for the lid, two strips to form the sides, and a second disc to form the bottom – make sure your layers are able to overlap and create a good seal. Melt the remaining butter and brush each side of your slices generously (we also greased the sides of the ramekin) and layer them up in the ramekin or pudding basin, making sure to overlap and press them down tightly. Pour in the puree and squish it in as tightly as you dare then put the lids on and place a good weight on the top (butter this too or add a layer of non-stick paper) before putting on a baking tray leaving for about 30 minutes to firm up.